Dr. Navid Baradarian and Dr. Lawrence Tesser always seek to serve the best interest of their patients. This is one reason our Manhattan and New York, NY, periodontal practice uses platelet rich plasma (PRP) therapy. PRP therapy can help accelerate the healing process by using your own blood platelets to help stimulate growth of new tissue. This is especially beneficial to patients who desire a faster recovery following surgical procedures. For nearly two decades, PRP therapy has been successfully used in orthopedic surgery and sports medicine. Recent advances in technology now allow the same methods to be utilized in the field of dentistry. PRP is a byproduct of your own blood that is incredibly rich in platelets. In the body, platelets naturally release growth factors and encourage blood clot formation, both of which are helpful in healing wounds and rapidly producing new host tissue. "By constantly evolving with the changing world of periodontics, our doctors can safely and effectively provide PRP therapy to our patients." Reduced Risk of Infection: Since the PRP is applied directly on the surgical site following your procedure, the wound is sealed off from bacteria, lowering the risk of infection. Accelerated Healing: When PRP is applied to the wound, tissue synthesis is increased, resulting in faster regeneration. Convenience: The amount of blood necessary to obtain PRP is minimal. If you choose IV sedation for your procedure, the blood sample can conveniently be taken the same time your IV port is placed. Safety: Since the PRP is harvested from your own blood, there is no risk of disease transmission. How is PRP Therapy Used in Periodontics? Bone Grafting: Bone grafts are commonly used for ridge augmentation, sinus lifts, or in preparation for a dental implant. PRP can help enhance the healing process in cases where bone is added for regeneration. 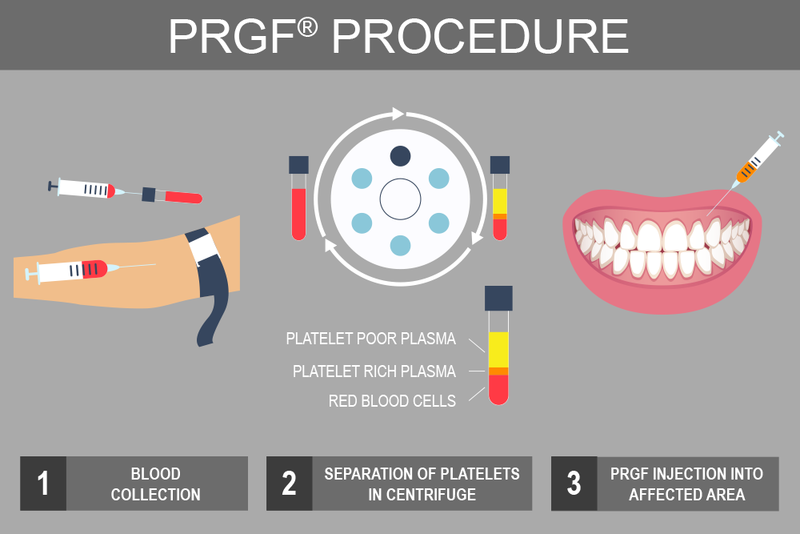 Gum Grafting: Clinical studies have confirmed that when placed in conjunction with a tissue graft, PRP effectively promotes healing and growth. Fistula Repair: If there is a passage between the oral cavity and the sinus space, PRP can be used to encourage healing and eliminate the fistula. Bone Repair: In cases where reconstruction is necessary due to the presence of a cyst or tumor, PRP can be used to promote faster healing. Dr. Baradarian and Dr. Tesser are committed to excellence. Our entire team participates in continuing education courses that help keep us on the cutting edge of dentistry. By constantly evolving with the changing world of periodontics, our doctors can safely and effectively provide PRP therapy to our patients.